The Global Educator: Virtually Awarded....and more! This time yesterday I was almost in a virtual panic! Our Net Generation Education Project Awards were about to start in ReactionGrid, an OpenSim virtual world, on the F.L.A.T.S., (Flat Learning Area for Teaching and Sharing). I blogged about this a while ago. Well, an hour before the official opening.....and 30 minutes or so afterwards, we were continuing to get students into the grid, stabilize and start the awards. So much time had been put into this ceremony, through press releases, online meetings, judges and meta-judges determining the multimedia winners. Led by our very own virtual pioneer, Vicki Davis, who spent hours preparing the slideshow and making sure everyone who wanted to had access to the awards in the virtual world, we took the plunge....over the cutting edge...into something we all knew very little about....but something we now have a lot more confidence with. When I say 'we' I mean the teachers involved in the project, as well as the students who had the opportunity to participate, including students from USA, Australia and Qatar. As colleague and Flat Classroom teacher here at Qatar Academy, Sam Liberto, said he never thought he would be in a classroom asking students to edit their avatar and transport to a virtual island. The language itself is alienating, but not anymore! But, back to the panic. Well, as a lead presenter in the Awards show I was to pick up my newly created dress, get it on and arrive at the F.L.A.T.S looking glam and ready to go. Well, it took a few trys and some real help from Chris (dress provider and tech guru) to transport me to the box that contained the clothes. Ok, click on box, save clothes to inventory, now WEAR clothes...hmmm. Sounds easy, but, then the grid wobbled, crashed. tried again, wobble, crash. message from organisers not to go in as too many participants were on the island flying and editing their appearance making it unstable. Panic....but what if it starts and I don't have my dress on?? Managed to get in, put the skirt on, lovely green flowing skirt....but the top would not go on, not sure why. Decided it was not important enough to keep asking Chris as she, along with other organisers was trying to stabilize the grid so we could start the show. 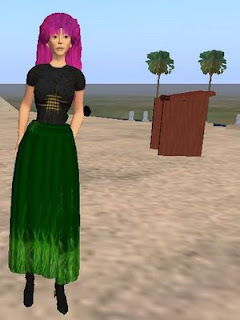 So, here I am, green evening skirt and TShirt, setting a new trend in fashion....do you like my pink hair? Vicki gave me that! As it turned out we managed to get through the awards and stream the audio into the Sim, but many participants did not manage to get in, including Vicki! Here is a pic of me, Dr Eric Brunsell and Steve Dembo standing 'near' the podium while we help present the awards. We also managed to connect with Don Tapscott (project instigator and author of Grown Up Digital) but not until after the official awards were over. Vicki is creating a final video and summary of the event and will paste Don in so that it sounds like he was there.....the joys of technology! Here is the Awards Slideshow featuring all winning students. All multimedia and can be found on the NetGenEd Ning, and the NetGenEd project wiki. View more presentations from flatclassrooms. Thanks for this very fair synopsis of the event Julie. We stumbled on technical choices as well as protocols & lack of pre-event practice, all things we will document for the next event. The users were incredibly patient with us. On the upside everyone was very positive despite the frustration & we are already working on making the videos, slides, audio stream and captured video to The FLATS island so anyone can login and see the event 24/7. An event like this has simply not been tried before on our platform so while we struggled we had a good look at the system and procedures and feel we can do much better next time. Thank you all for your patience pioneerng with us. Kyle, you all did a wonderful job. yes, we understand this is all new ground. I have been in communication with virtual (as in distant collegues) and real (as in my colleagues here in Qatar) participants who all had a unique experience and ALL had a story to tell...and were excitedly telling it today, about their virtual experience. Thank you! for the opportunity. I do hope we have another chance to try this again.